While Modojo typically covers elements of smartphone and tablet markets, we also deal in cool technology that's geared toward all types of on-the-go consumers. 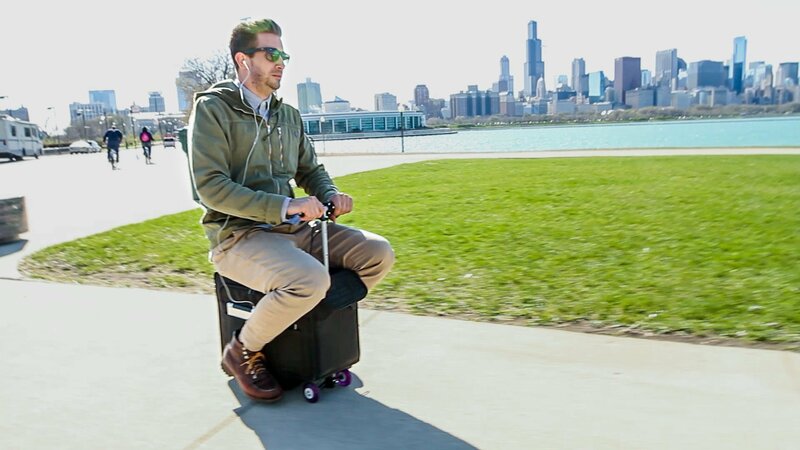 One such device, and arguably one of the coolest devices to emerge this year, is the new Modobag, the first smart-enabled motorized carry-on luggage that allows users to stash their goodies for air travel and then ride around airports using an on-board electric motor. With a host of features geared toward modern tech consumers and a surprising 6 mile range, the Modobag stands to bring speed and convenience to the traditional airport experience. He's everything we know about the device. The Modobag is the brain child of Chicago-based entrepreneur and self-proclaimed travel enthusiast Kevin O'Donnell. Inspired by an instance of pulling his children around an airport on top of his luggage, the first thoughts of a motorized luggage bag began to form. Working together with friend and motorcyclist Boyd Bruner, the two began their first designs for the Modobag. After a successful campaign on crowdfunding site Indiegogo, the Modobag started nearing its goal points, and the company at Modobag LLC began shipping out the first units this past September with plans to ship an additional 100 units per week. The Modobag consists of a high-strength ballistic nylon shell wrapped around an aluminum chassis; at just under two feet long and 14 inches deep, the Modobag features 2,000 cubic inches of interior space. Telescopic handlebars control the bag's steering while power is delivered from TSA-compliant batteries to a 150-watt brushed electric motor that's capable of propelling riders up to a top speed of 8 miles per hour on flat surfaces. Due to the strength of the frame, the Modobag can also accomodate riders up to 260 pounds in relative comfort thanks to its memory foam seat pad, and though additional weight will have an affect on both top speed and overall range, the Modobag has an indicated range of up to 6 miles. Airline compliancy is a big part of the Modobag's design, and as such, the bag as well as its battery and engine all meet the standard compliances for the UN, FAA, IATA, and TSA. It's even somewhat light too, weighing just 20 pounds dry, which should allow most active users to stash the Modobag away without an egregious amount of effort. All this means that most travelers should have no issues carrying or riding the Modobag, even in some of the biggest airports around the globe. In addition to the performance of the engine and drivetrain, the Modobag also has a number of features that should all that time spent waiting around airports travel more convenient. The bag features a blue-backlit LED display that indicates available charge, and twin USB ports are located on top of the unit to keep electronic devices like phones and tablets topped up between flights. Travel fans interested in picking up the Modobag likely already know that the device won't come cheap. Currently, the Modobag can be ordered for $1295 plus shipping through the bag's Indiegogo page, with shipping expected to begin around November. Beyond that, the bag is expected to sell at a retail price of $1,495. Users can also pay $69 extra to get access to the Modobag tracking app, which uses GSM and GPRS technology to allow Modobag owners to keep track of their belongings regardless of where the Modobag may wind up. Nothing is quite as cool as stoage-turned-transportation, but we still have loads of cool mobile accessories and portable tech featured on our list of the Best Mobile Accessories.